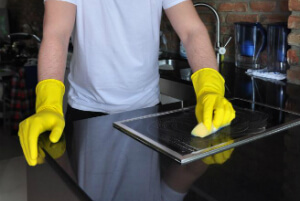 Oven Cleaners Domestic & Commercial Kitchen Middlesex UB | Quality Property Care Ltd.
Quality Property Care Ltd. is a professional oven cleaning company, which provides residential and commercial oven cleaning. We deep scrub ovens of all kinds for residents, expert kitchens and businesses in Middlesex UB and the area. The oven cleaning service involves the disassembly, scrubbing, cleaning and soaking of each part and then assembly of the oven. The service is performed by insured, trained and certified oven cleaners at a great oven cleaning price. Besides the deep oven cleaning, you can book microwave cleaning, cleaning of your freezer, fridge, cooktops, warming drawers, grill and BBQ, as well as an overall home and business kitchen cleaning. Save energy and cook healthier food after the green and safe deep oven cleaning service. No matter what type of oven or cooker you have, call us online or by phone now, and get a free quote for the requested service. The expert oven cleaners from Quality Property Care Ltd. will first test your oven in your presence, and then proceed to disassemble it into parts. The cleaner removes all pans, panels, racks, trays, control knobs, the light protector, extractor filters, fans and dips them in a completely safe, professional and efficient cleaning solution for a while. Next all the parts are scrubbed meticulously with wire brushed and sponges for some final cleansing from all the grease, burnt on carbon and grime. They are rinsed off and left to dry. Then the oven is put back together. It is tested once again. It can be used for cooking tasty and healthy food right after the cleaning procedure. This is a service which let us properly clean your freezer or fridge, from the inside and out. First we inspect the freezer or fridge and determine what should be cleaned. Every part that can be dismantled is cleaned separately. We use a organic mixture which allows us to remove any leftover food particles and stains. It removes and prevents bacteria growths and mould growth inside the fridge or freezer. Each part , once fully cleaned, is put back inside and the fridge and freezer are left to dry. Once completely dry they can be used immediately. BBQs and grills tend to accumulate quite a lot of food on them. A lot of burnt flesh and other particles are left if not scrubbed afterwards. This build up of carbonized matter releases gases during the cooking process. It enters the food and makes it taste a lot more different. We soak the detachable barbecue and grill parts to eliminate any grease and residue leftover. When everything is cleaned, it is reassembled. The BBQ and grill are ready for usage. To properly clean your oven, no matter of its type, we use a dip tank method to degrease all removable oven parts. First we take apart anything we can, trays and extractors are removed and dipped into a mixture of detergent and water. That way they are fully stripped from even the stickiest of grease patches. Panels, control knobs, racks, extractor filters and trays are all removed and dipped in the tank to soak while the main service is being performed. Once all parts are removed we start eliminating the burnt carbonised food leftovers. If left there this may damage the fans and filters of the oven as well as affect the quality and taste of the food. To start degreasing the oven we use a special detergent that removes the bind of the fat molecules bound to the surface of the oven panels. It leaves no trace and is harmless once wiped clean. We manually scrape any leftover grease from the oven and the removed parts, all dirt and stains are eliminated with a special spatula. 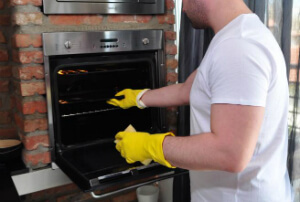 As an trusted cleaning expert that has been working in the field for many years, Quality Property Care Ltd. is a reliable oven cleaning company that can handle all types of ovens. We dismantle the devices for more detailed cleaning. In the end, we re-assemble them with no extra charging. Submit an order for flawless oven cleaning in Middlesex UB. Make your dishes nicer and healthier. We will remove all the stubborn stains and burnt. We also eliminate the sticky spots and the organic leftover residues. Feel the difference in your clean kitchen and enjoy your cooking with a sanitised and freshed up oven. It is cheap and easy now! Don`t give up on healthy cooking and don't risk the life of people around you! Get the oven cleaning Middlesex UB deal now! Contact us on 020 3746 4287 and get your free quote or ask for additional information. Keep cooking tasty and healthy with Quality Property Care Ltd. and book professional oven cleaning service today!